A Life to Live’s monthly microchip and adoption event at PetSmart in Baytown had a little different flavor to it on Sunday, Sept. 24. “More” was the word of the day. While we typically offer 100 microchips at these events, with the first 10 being free, this time we had 200 free microchips available. That was thanks to Found Animals and Chevron Phillips Chemical. Spay-Neuter Assistance Program (SNAP) was on hand to provide free wellness care to pets whose owners were impacted by Hurricane Harvey. Services included vaccines, deworming and flea prevention. 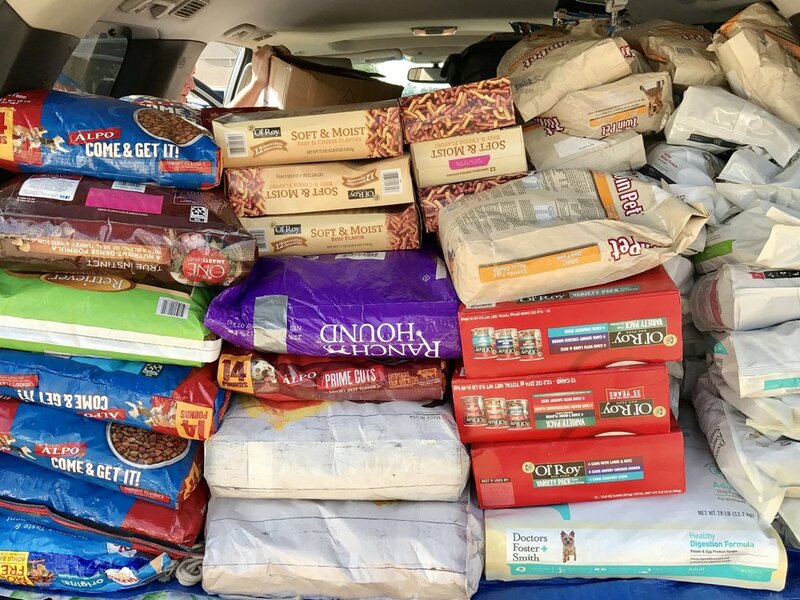 We had two vehicles packed with free pet food from our food bank to provide to pet owners in need. And as always, adoptable cats and dogs were putting their best paws forward in hopes of finding their forever homes. More than 125 pets had microchips administered and registered. Free vaccines and products were provided to residents with verification of FEMA assistance. Bags and cans of pet food were distributed to owners for their hungry pets. Three of our foster pets were adopted, as were 20 animals from City of Baytown Animal Services, which had its mobile unit on site. Chevron Phillips Chemical volunteers kept everyone cool by handing out cold water. For 84-year-old Bill Bagwell, getting his dog, Paint, micro-chipped was worth the trip from his Highlands home. “He goes with me just about everywhere, and he usually knows the way home. But I don’t want to take the chance if he ever gets away. If he gets lost out on the road somewhere, this way he can come back to me,” said Bill, who rescued the stray Australian Cattle Dog about seven years ago. Gabriel Lee of Baytown also wanted that sense of security for his family and their two small dogs, Mimi and Gabriella. A Life to Live holds adoption and microchip events throughout the year. Check our calendar for future events.